Last night a spy was in our midst. As if Jonathon’s presentation wasn’t stimulating enough. Not only is Jonathon Ross of Andersen Ross a hugely talented photographer and business person, his fast past, energetic speaking style and his generosity in crediting his entire team had me admiring him all the more. *Cast calls include FIRST a signed model release. Then photos taken have dual purpose: remembering the model and increasing your stock portfolio with each click. *Have additional props and clothes on hand for cast calls as well as arranged sessions including “classicâ€ clothing in a variety of sizes. *Models might include friends, family, and anyone you meet. * Models come in all shapes, colors, sizes, and levels of attractiveness. No surprise though; Attractive still sells best! * Advertise your need for models in places frequented by the people you want. Health clubs are great for finding fit models. Post an ad on the club board. A) Collecting signed model releases from models, locations, and property including homes, boats, art. B) Arranges access to locations and gets signed releases, pays fees. C) Buys or collects props for shoots, covers identifiable branding, keeps photographer abreast of shot list and modelâ€™s schedule. *Donâ€™t stop shooting what you love, but figure out what brings in the most dollars. Then you can make an informed choice about the cost of producing different types of sessions, and what youâ€™re priorities are. You can shoot what you want when you retire (early!). So here’s Jonathon, Mr Diversity himself. He’s represented at the big agencies , having toes in rights managed, royalty free, and his own stock agency, Blend Images. Reluctantly, he is currently researching the implications of the micro-stock agencies. (Andersen-Ross has no plans to enter the micro stock market.) Having shared this with a sigh and slightly shaking head, we were all shaken when up pops a momentarily sheepish (but ultimately articulate) Chad Bridwell. “I’m with one of “those” micro stock agencies”, Chad states a bit nervously, as if anticipating the pounce of a group of 30. Still physically intact and building confidence, he explains the positive side of receiving $1 per image. $1 thirty times in a month is still $30. The “big boys” with fotolia are making “big bucks”. Really? I felt like I was having DÃ©jÃ vu. Eight to ten years ago at an ASMP presentation we were comparing royalty free vs. traditional rights managed stock agencies. Jonathon was then in Chad’s shoes, feeling perhaps like the outcast “bad guy” who was challenging tradition. Jonathon represented the guy making “big bucks” which was believed to be a far cry from what the traditional stock shooters were making. You don’t hear Jonathon complaining, but he’s watching this downward trend closely, and isn’t joining the micro stock set anytime soon. What seems clear is that Micro Stock is here to stay, at least in some form. While there may be dramatic erosion of principal now, having one more way to create income can’t be all bad, at least for hobbiests. And diversity of income source is Good. On a personal note, I see opportunity here, yet I see long term returns moving downward perhaps leaving only the agency owners able to make a living. (Without having a second job, that is.) I am certainly tempted by the “if you can’t beat ’em, join ’em” chorus. Photography in all it’s forms is still a fun and exciting job to have. Hey, I used to house clean. TALK about a tough job! But for now, I’d rather be a professional photographer and clean on the side, than the other way around. 😉 I’m sticking with rights managed and a royalty free until I know more about this threatening trend. Thanks Jonathon, for both your talk, and your follow-up e-mails to clarify your current perspective. Jonathon sharing 110 selects from an all day shoot. All were great, attesting to his huge success. Dum dum dum duuuuuummmm. Talk about a serious moment. When Chad said he was with â€œone of THOSE micro stock agenciesâ€ of which Jonathon spoke, a tense hush filled the studioâ€¦ But sadly, with camera at the ready, no fist fighting broke out. 😉 They probably wouldn’t have signed a release anyway. But Chad’s honest, thoughtful presentation of fotolia had us all breathing a sigh of relief. Jonathon and Chad proceeded to have an intelligent, if initially tense conversation from which we all benefited. These bonus moments keep life interesting, and our minds expanding. Kudos to both J and C for keeping guards down and minds open. Hey Jonathon, do I need a model release for the profile shot? I guess really I should be asking Chris Bowden and Amanda Ringstad, the Profilers themselves. The pretty gal in the green is Mardee Austin. I feel even luckier than usual. 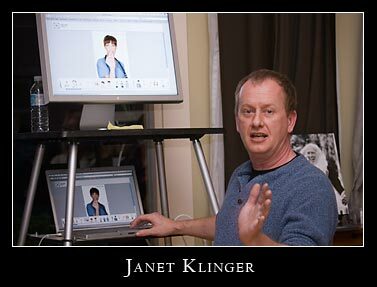 Sheâ€™s agreed to become a part of the Janet Klinger Photo Team. With a degree in marketing, and a warm, caring way with people, Mardee joins us April 9th as our client liaison and marketing maven. Iâ€™m SO excited and honored to have Mardee on board! Mardee Austin - Thanks Janet! Your Marketing MAVEN? I like that! I am thrilled to be part of your team.